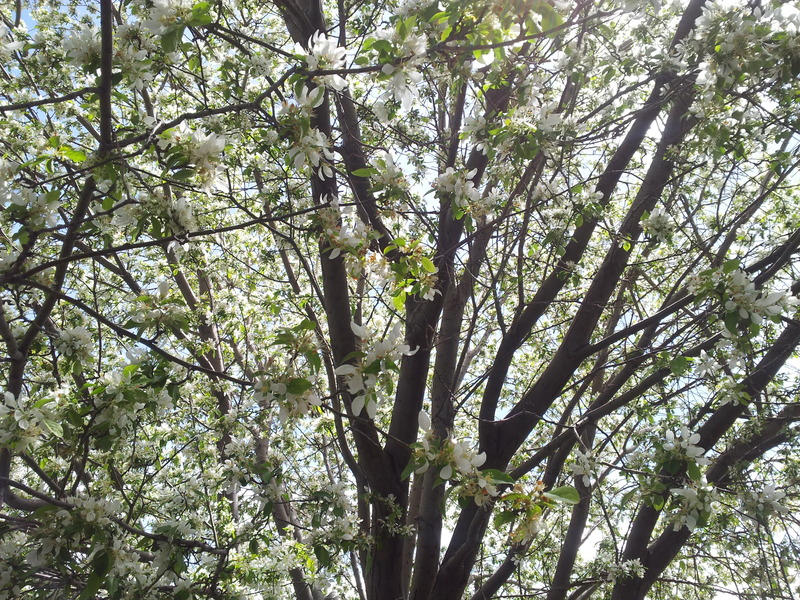 A canopy of white blossoms rise high above as I sweep the sidewalk. I’m sweaty. Aching from hours of yard work. Dirt blackens the space beneath my fingernails. A gentle breeze, cool and fragrant, teases my hair, and I straighten. Pause. Those blossoms smell how I imagine heaven. I let the scent, the stirring of air, refresh my body and my soul. Did He stir the branches? Send the breeze, the fragrance? Or it is just how the Creator planned it out years ago. Scientific. Maybe God is big enough to have planned out my encounters with nature even before I was born. Maybe when He set his plans in motion, spoke the seed for this beautiful tree into existence, He had me in mind even then. Doesn’t the first chapter of Ephesians support this way of thinking? This God who plans with me in mind? I choose to believe this moment is personal. He SEES ME. Wants to bless me. To cover my aching, weary body and soul with His perfume. She admits the struggle for gratitude. Like her, my writing of over 1,000 thanks sometimes felt juvenile. I didn’t know then I was driving out a nail by another nail. That I was practicing what it is like to live a life of moments embraced and noticed with thanksgiving before they march on, lost in time, pushing me to hurry without living. That noticing the little things and giving thanks to the One teaches me to live with Him. Notice Him. Trust Him. Slow down and embrace Him as I delight in His gifts. i still practice. Choosing to hammer gratitude. Trust. Faith. For my soul. My mental and spiritual health. And for my body I hammer healthier choices. Salad. Walks. Water. Sometimes I awake fearful again. And which nail do I pick up? I want to practice trust. To drive out unbelief with faith. To grow as one who walks in peace with the Father. Believing He is personal. He sees. Me. Sometimes, like the last six weeks or so, I curl in a ball instead of walking. Gaining a few pounds from not choosing the nail of activity. And maybe that was ok, this drawing into myself to grieve. This wintering. As long as I come out. And there’s nothing like spring to draw me from winter, tempting me with fragrant breezes. Reminding me that He sees. Ah, the scent of spring! Perhaps it smells sweeter after a winter without it. In the same way we have to have the pain to appreciate the joy. Now is your time for some joy I think. Thank you, Marie. What beautiful thoughts. Hugs to you! I have thought about doing the 1000 gifts thing but have been too stubborn to try it thus far. Almost like, could joy really be that simple? I love reading Ann Voskamp. I hear you. And, no, I don’t think joy can be “that easy.” What I discovered when I did my 1000 Gifts exercise wasn’t an immediate cross-over to joy, but a discovery of grace, beauty, good in the midst of good seasons and bad. (Took me about a year and a half and I didn’t do it daily, mostly recorded my gratitude thoughts on either really good or really bad days, several at a time.) I remember right after my second car accident I mostly thought of that month surrounding the accident as a very bad time. Everything was colored by the wreck and my injuries and struggles. But then I penned everything I could think of to be thankful for during that time period and was overwhelmed by all the GOOD I experienced. I don’t know if this is good, but my penning of gifts was often an exercise of determination when I was especially struggling. What I discovered is my spirits usually lifted after focusing for an extended time on the things that were good and beautiful in my life. I read 1000 Gifts a few years ago. Now I’m doing the devotional. It has helped me process joy in a way the book didn’t. My story is that many years ago I prayed for joy. Repeatedly, for a season of time. What happened next is 7 extremely difficult years where my entire family went through really hard stuff, sickness, near death, surgeries, emotional upheavals, financial crisis, blah, blah, blah. It did not feel like an answer to those multiple prayers that I would learn joy. But what I’m processing now is how much I’ve learned (and am learning–I don’t think I’ve “arrived”) about the kind of contentment that Paul talks about when he says he knows how to be content in all circumstances. And this is somehow connected to gratitude and joy and learning these things in the seasons of struggle, not just in the seasons of hope. I don’t know that I’m ready to dig into that topic fully yet, my thoughts are still new and being shaped, but I do believe that thankfulness is connected to trusting God, recognizing His gifts, and that this is somehow connected to joy. All that to say that I’d encourage you to take that 1000 gifts challenge and start penning the things you are grateful for and see where it leads you.